1. Melt 1 stick butter in a small saucepan over medium-low heat and continue to cook until butter begins to smell nutty and lightly brown. Remove from heat and cool completely. 2. Place butter in a bowl and using an electric mixer, beat until light and fluffy. 3. Add both sugars and continue to beat together until light and fluffy. 4. Scrape down sides of the bowl, add molasses and vanilla and continue to mix together. 5. Stir in egg and egg yolk. 6. In another bowl whisk dry ingredients together and add to the butter mixture. 7. Beat together until a dough comes together. 8. 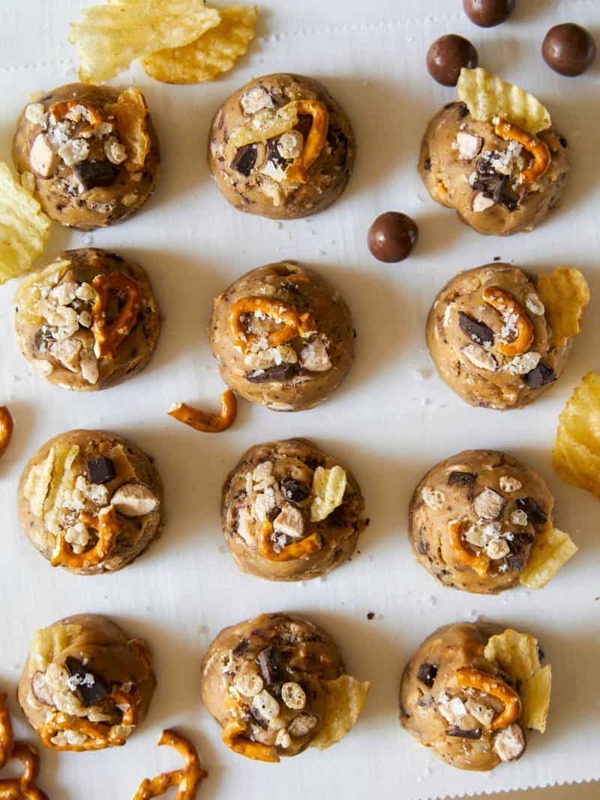 Fold in chopped chocolate, rice cereal, potato chips, pretzels, whoppers, and toffee bits until fully combined (you can also reserve a little of each mix-in to press onto the top of each cookie, before baking). 9. Wrap dough in plastic wrap and chill in the refrigerator for at least 1 hour and up to 3 days. 10. Preheat oven to 350˚F. 11. Scoop 3 1/2 tablespoon sized balls onto a parchment lined baking sheet, about 1 1/2 inches apart. 12. 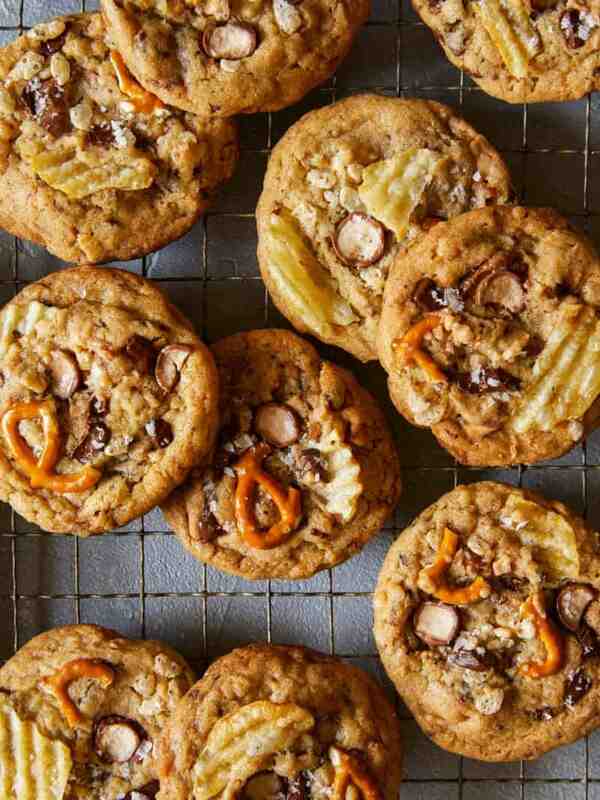 Sprinkle cookies with sea salt flakes (and any reserved mix-ins) and bake for 12 to 14 minutes or until cookies are golden brown. 13. Cool cookies and serve warm. love this! 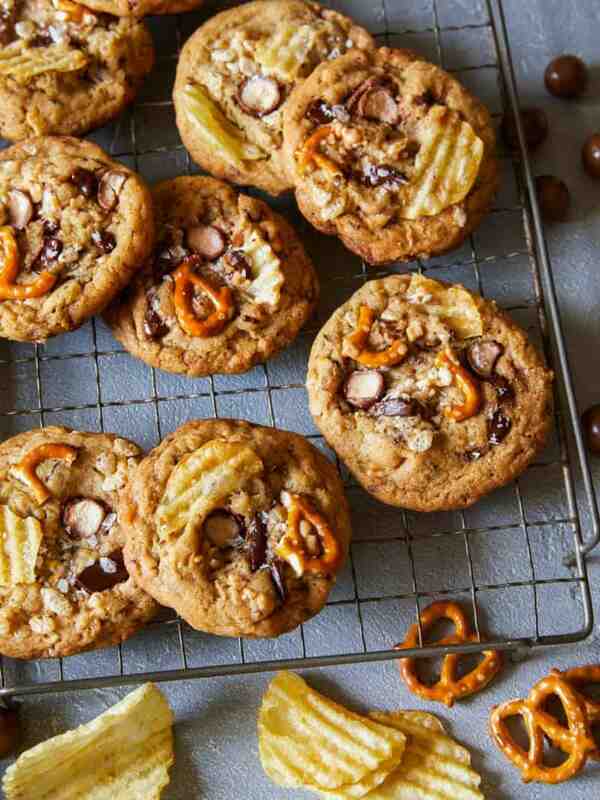 I know I’ve never had all of these things in one bite or cookie before and now you’ve given me the perfect excuse, so thank you for that and for this recipe!